Each year, we raise hundreds of dollars for our shul while shopping for groceries at Ralphs. Supporting our Ralphs program is as easy as 1-2-3! STEP 1. Send your name and snail mail address to Shoshi at Motek2222@gmail.com and you will receive a letter. STEP 2. 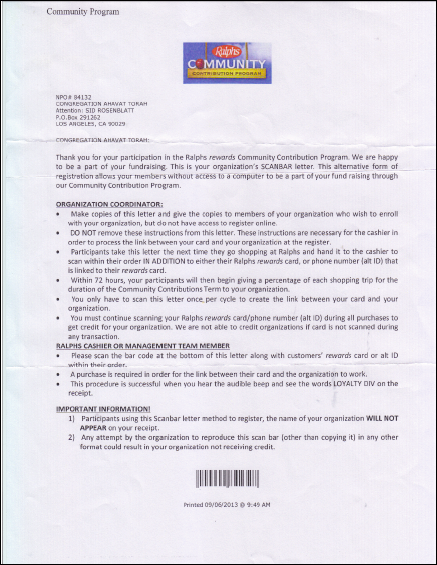 Take the letter to your Ralphs supermarket where it will be registered with your Ralphs Reward Card. STEP 3. Once the letter has been registered, you do not have to submit it again until renewal time which occurs each September.